Ronald Reagan served as the 33rd Governor of California and the 40th President of the United States. Douglas Van Howd, White House Artist for the Reagan Administration, sculpted this maquette in preparation for the 8′ monument for the California State Capitol in Sacramento, which was unveiled on June 22, 2015. 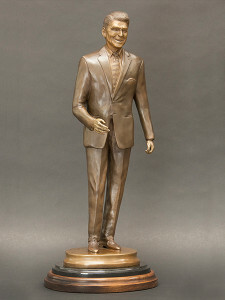 A second casting of this monument, commissioned for the Ronald Reagan Presidential Library in Simi Valley, was unveiled on November 4, 2016, the library’s 25th anniversary.